Preheat oven to 375 degrees F. Grease a 2-quart casserole; set aside. Cook pasta according to package directions; drain. Return to pan. Meanwhile, in a medium saucepan, heat butter over medium heat. Add garlic; cook and stir for 30 seconds. Stir in flour, salt, and white pepper. Gradually stir in milk. Cook and stir until thickened and bubbly. 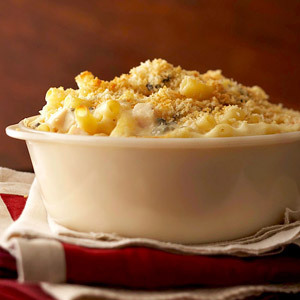 Gradually add Asiago cheese, fontina cheese, and blue cheese, stirring until melted. Stir in chicken. Stir chicken mixture into cooked pasta. Transfer mixture to the prepared casserole. In a small bowl, combine panko and truffle oil; sprinkle over pasta mixture. Bake, uncovered, about 25 minutes or until mixture is heated through and crumbs are lightly browned. Let stand for 10 minutes before serving.